BOOM! Crash Landing on Planet Java Hive is a Gourmand Lover's Delight! Surprise folks, time for a NEW CK-6 Offering, Planet Java Hive! Aside from our usual high quality skin food, Planet Java Hive also contains Coffee Hydrosol, Beeswax Absolute, Coffeeberry Extract, & Pure Manuka Honey! Coffee Hydrosol: Known to contain anti-aging properties, and also aids in reducing inflammation. Not to mention it smells amazing! Beeswax Absolute: Very delicious and sweet, made from the wax of bees’ honeycomb, its rich warm aroma has fine notes of honey and pollen with a soft green hay-like body note and a mild, waxy undertone. Coffeeberry Extract: The polyphenolic antioxidant in Coffeeberry is thought to soak up damaging free radicals and remove wrinkles. Polyphenols from Coffeeberry also act as anti-inflammatory. Truly magical stuff and the perfect addition to an aftershave. Manuka Honey: Produced by bees that feed on the manuka shrub of New Zealand’s remote North Island. Due to its anti-inflammatory properties, manuka honey reduces redness and heals congested or inflamed skin. Additionally, Manuka oxygenates pores to draw out bacteria. Hydrates: When applied to your skin, manuka will hold in moisture and absorb moisture from the air. Anti-aging: Because of its moisturizing properties, manuka retains moisture without making skin oily, it also inhibits MMP, a group of enzymes that destroy collagen. 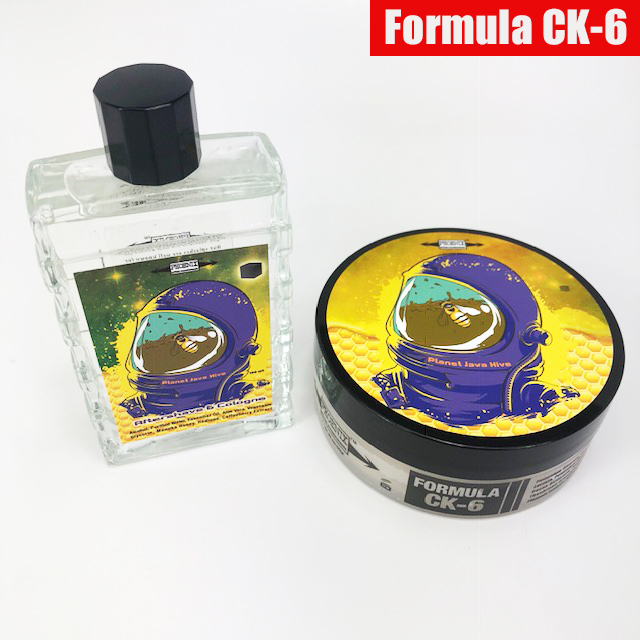 Yeah, as if the scent profile was not already epic we go ahead and release it in our Ultra Premium CK-6 Formula! If you have yet to try our latest recipe, you are REALLY IN FOR A TREAT! But again, aside from being made up of some most epic ingredients, Planet Java Hive is a truly memorable gourmand! The scent is really captivating, infectious and addictive. I have found myself more than once returning to the bottle just to take a sniff! You deserve it to yourself to take a crash landing on Planet Java Hive today!